Recently I posted of that ‘million dollar catch’ – the catch by the spectator sponsored by – Tui brand beer…… Corey Anderson, the fast emerging star, hit one hard and high - and made Jatinder Singh richer by Rs.52.16 lakhs….. a mouthwatering 1,00,000 NZ dollars. In Kiwiland, as a proud sponsor of New Zealand Cricket, Tui Brewery ensured that there’s as much action in the stands as on the pitch with Tui Catch a Million. The result has been a sea of Tui orange at grounds ~ with two winners already. To the sponsors, occasion of watching cricket is as important as the game itself, and Kiwis don’t need much motivation to make things interesting in the stands. Sure you have read of - Berkshire Hathaway Inc., an American multinational conglomerate holding company headquartered in Omaha, Nebraska, United States. The company wholly owns GEICO, BNSF, Lubrizol, Dairy Queen, Fruit of the Loom, Helzberg Diamonds and NetJets, owns half of Heinz, undisclosed percentage of Mars and more…. The company is known for its control by investor Warren Buffett, who is the company's chairman, president and CEO. Buffett has used the "float" provided by Berkshire Hathaway's insurance operations (paid premiums which are not held in reserves for reported claims and may be invested) to finance his investments. According to the Forbes Global 2000 list and formula, Berkshire Hathaway is the ninth largest public company in the world. India has long been viewed as a value investor's dream: rapid growth, 1.2 billion people pining for a taste of globalisation, and underdeveloped industries ripe for turnarounds. So it surprised few when the genre's guru, Warren Buffett, placed a bet on the world's ninth-biggest economy ~ but that surprise was not to last longer as billionaire's Berkshire Hathaway decided to give up on India's insurance market after just two years. Adding to the drama, the withdrawal came the same week India unveiled plans to open the economy as never before to FDI. We know BCCI too well….. away in USA, the National Collegiate Athletic Association (NCAA) is a nonprofit association of 1,281 institutions, conferences, organizations, and individuals that organizes the athletic programs of many colleges and universities in the United States and Canada. It is headquartered in Indianapolis, Indiana. Over there, the 2014 NCAA Men's Division I Basketball Tournament will involve 68 teams playing in a single-elimination tournament to determine the national champion of men's NCAA Division I college basketball. It is scheduled to begin on March 18, 2014 and will conclude with the championship game on April 7 at AT&T Stadium in Arlington, Texas. ……….. and much before the game starts – the predictions also start…. At Chepauk – days before the Test match, we used to discuss of the pitch, the possible combinations, the toss and various other factors that could impact the result… people used to enter the ground early in the morning ….as the two Umpires take the walk – as early as people could sight the cap of the men in white & black, stadium would come alive….. ‘WASP’ was not there those days… but many people used to predict the result of the game correctly !! Away in USA, each March, tens of millions of brackets are filled out in the hopes of predicting the outcome of the N.C.A.A.’s men’s basketball tournament. But the odds that a bracket will be perfect, that is, every game guessed correctly, are long — to the tune of 9.2 quintillion to one. That tilts the scale against the bettor…. Probably that made them announce a deal of $1 billion…… yes, the head-spinning - $1 billion is being offered by Quicken Loans, the Detroit-based mortgage lender, with the backing of Warren E. Buffett’s Berkshire Hathaway, to anyone who fills out a perfect 2014 tournament bracket. The prize money will be paid out in 40 annual payments of $25 million, or a one-time lump sum of $500 million. The first 10 million people who enter the contest will be eligible for the grand prize. Just like Amitabh handing over a cheque in the Kaun Banega Crorepathi, Mr Buffet is quoted as stating - “If there’s one left at the end, I plan to go to the game with him or her. I’ll take a check along in my pocket.” Reports state that the idea was hatched when Mr. Buffett was in Detroit on Nov. 26 for Goldman Sachs’s 10,000 Small Businesses initiative when he met up with Dan Gilbert and the two toured Detroit………. Interestingly, the two plan to fill out their own brackets and have a side bet on this year’s tournament. Historically, Mr. Buffett seems to have an appetite for insuring unusual events ~ and of course the premium paid is not disclosed. Newspaper reports state that Berkshire Hathaway earlier insured a $260 million permanent disability policy on the baseball player Alex Rodriguez when he joined the Texas Rangers. That to me is not an apple to apple comparison…….even given the fact that the odds of filling out a perfect bracket are almost non-existent. A Prof of Mathematics is quoted as stating that - With 64 teams (the four play-in teams are excluded in the contest), the odds are more than the number nine quintillion, or the number nine followed by 18 zeros. The odds go down if you know something about basketball to one in 128 billion, he said. There could never have been a documented perfect bracket …. Yet it is only improbably Mathematically, ~ in life things could be different…. We have seen captains losing tosses continuously throughout the series though that probability could be far difficult to occur. Despite the long odds, Jay Farner, the president and chief marketing officer of Quicken Loans, said he was “super hopeful” that there would be a billion-dollar winner. To conclude – before you hazard a guess on winners, think of how much did Quicken Loans pay Berkshire Hathaway Inc. to insure the billion-dollar prize. “Too much,” says Quicken's Dan Gilbert. “Not enough,” says Berkshire's Warren Buffett !! 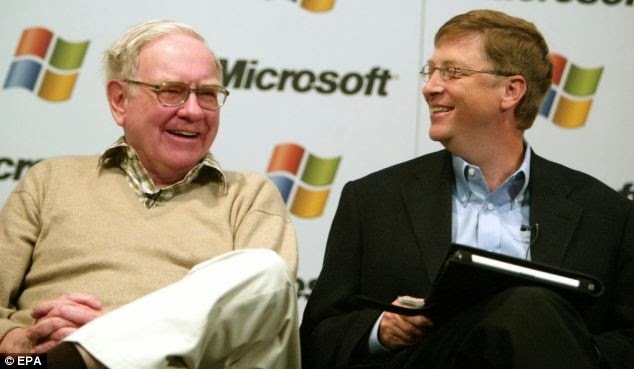 PS : just in case, you are still to ask… the one in photo with Bill Gates is Warren Buffet, one of the richest men of the globe.